The Celsius 52-Premier is similar to the Celsius 32-Prime. It is a low-pressure sun bed that consists of 52 160 watt Celsius VHR lamps. When looking at this bed, you will still notice the lamps are very close together, but the increased quantity of lamps provides a larger, more comfortable tanning surface with a more contoured acrylic. The contour, or curvature, of the acrylic decreases the pressure points caused by the reduced circulation of laying on a flat surface. The increased number of lamps provides an overall increase in wattage resulting in a faster tan. 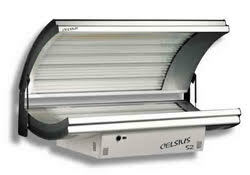 The maximum tanning time on the Celsius 52-Premier is 10 minutes.